Pedal exercisers frequently draw comparisons to miniature exercise bikes because they closely resemble the crank pedals of conventional bicycles. 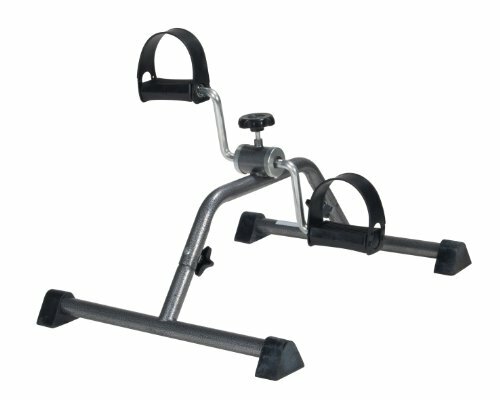 Pedal exercisers, however, are unique pieces of cardiovascular equipment that have both rehabilitative and household applications. Specifically, they are designed to help tone and increase the strength of the legs and arms, increasing your range of motion, and enhancing your lower and upper body strength. As well, they are great at increasing blood circulation and burning calories, which is very useful for people who find themselves occupying sedentary positions for long periods of time. Office workers stuck at a 9 to 5 job can tuck it beneath their desks and get some needed exercise. Or people that are recovering from a surgery with limited mobility can use them to get a dose of cardio exercise in their homes while they watch television or read the paper. These seatless exercisers allow you to adjust the pedal resistance settings, so you can customize the rigor of the exercise to your needs- suiting it more or less challenging workouts. Let's check out our favorite pedal exercisers! 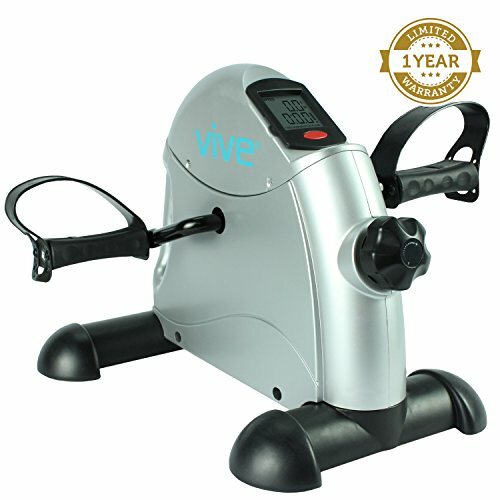 For patients who are undergoing physical rehabilitation, this lightweight and portable medical pedal exerciser is very useful. It helps strengthen the muscles in the arms and legs and is critical to improving blood circulation. With dimensions of 16.93″(L) by 7.01″(W) by 12.2″(H), it is a compact option, allowing for easy storage and transportation. While in use, its four anti-slip rubber pads work to keep it in place and prevent slipping. This device is ideal for low-impact exercise. The level of difficulty can be customized with the adjustable tension. It has received some solid endorsements from its user base, though some users complained that their device became squeaky. A little oil fixed that problem, however – which is standard maintenance that you typically have to provide units like this. Use this folding cycle if you want to burn excess fat while still working on your computer or reading a book. This exercise device sits on a tabletop or on the floor. It comes with a battery-operated monitor for tracking your workout time. It also has varied resistance levels that can be easily adjusted with the tension control. Portability is one of its advantages as it only measures 19W by 15.25H by 12.25D inches. Another good feature is its sturdy foot straps for stability. It firmly stays in place as it has non-slip rubber feet. A broad majority of its users have given it top-level endorsements. A number of buyers say that this peddler looks heavier than it actually is. But there are enough users who enjoy its performance to make this a solid option if you are looking for a quality pedal exerciser. On top of that, it has advanced features that are lacking in other similar pedal exercisers. With its large digital LCD screen, users can easily monitor the RPM, distance covered, time, speed and number of calories burned. It is also multi-purpose and can be used for low-impact workout by the hands or feet. Whether you are undergoing physical rehabilitation or simply like to enhance your hand and arm muscle strength, you can benefit from this device. This exerciser allows you to experience low-impact exercise on a sturdy machine, anytime and anywhere. Users enjoy using it while working on their laptop or doing other home or office tasks. It is constructed from one single piece of triple-layered heavy duty stainless steel, giving it more stability. The adjustable straps are useful when exercising the feet. Additionally, it has reinforced rubber feet and a platform which offers additional traction when it sits on any surface. User feed back has been pretty solid, with many customers describing their high-levels of satisfaction with their Eva exerciser. This product has a dimension of 16″(W) x 20″(D) x 14″(H) and it does come fully assembled. Garnering above average endorsements from the users we spoke with, this heavy duty stationary exerciser is great for people who are trying to shed excess weight but have no time to leave their desk. This equipment can be mounted on a table to exercise the arms or on the floor to exercise the feet. It has an LCD monitor that displays the time, the strides in minutes, revolutions and calories burned. It also has pedal straps to keep the feet in place while pedaling. People undergoing physiotherapy can benefit from its use as it promotes muscle strength and improves blood circulation. The tension can be adjusted as needed. 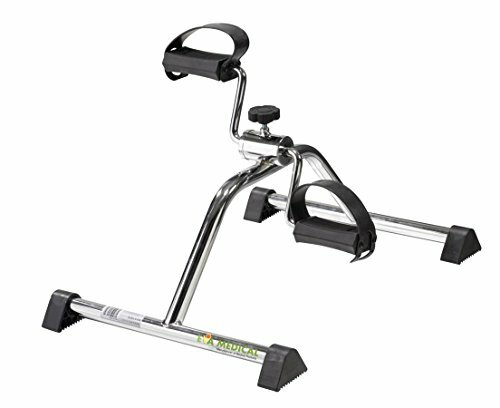 Customers appreciated that many pedal exercisers are light-weight and collapsible because they did not take up much space in their homes or offices. Many users also enjoyed that the exercise equipment was usable while watching television, reading a book, browsing the Internet, or while doing variety of other tasks. As we allude to before, pedal exercisers have therapeutic applications as well. Many people that are rehabbing from surgery find that these devices are especially convenient. Wheelchair users often use pedal exercisers to get in an upper body aerobic workout. Users also like that the pedal exerciser can be used at a very slow speed. This is especially good for older exercisers who can sit back on the couch and watch TV while also burning calories at their own pace. Younger users, as well, also found this to be a great device to burn calories outside of the gym. So, it’s use is not limited to older people, for those that are disabled by a medical complaint, there are younger users who find this to be a convenient cardiovascular exercise solution. Some users also report using ankle weights, typically 3 to 5 pounds per leg, and wearing them as they paddled to burn extra calories. Some obese users also indicate that they chose a pedal exerciser over a stationary bike. 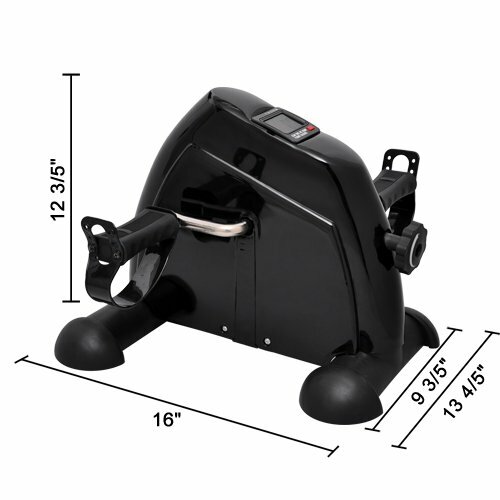 The pedal exerciser is a more viable fitness alternative for overweight people, in some cases because of mobility issues that the obese commonly encounter. 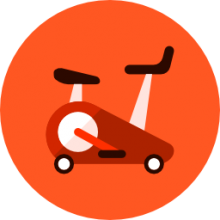 These devices typically come either fully or close to fully assembled, so there is not the usual concern when purchasing exercise equipment that it will have to be assembled using a variety of tools that you may not have on hand. In the case where the places do you need to be assembled, typically all that you will require is an Allen wrench, which is customarily provided with the device. Some units do generate significant amounts of heat after extensive use. 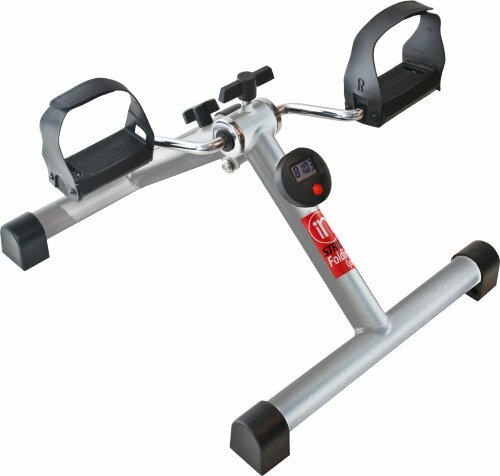 Many users also note that pedal exercisers are best used in carpeted areas, or on other surfaces like a yoga mat, where there is some grip attraction. When used vigorously on a wood floor there’s a potential that the pedal exerciser will shift around a little bit. Sometimes the pedals can be a bit slippery for some people, particularly if you are using it in just your socks. One enterprising user reported adding a bit of adhesive to the pedals to ensure that his mothers feet did not slip off during exercise use. Tightening the pedal straps can also be another way of ensuring that your feet do not fall off the petals while you are using the equipment. All in all, these devices are terrific for a range of different types of people. Many people buy these devices for older relatives that are suffering from arthritis, back pain, or for people that are sedentary. Alternatively, people that just want to get in a good cardio session can place these under their desks at work, or position them in front of the television so that they can watch their favorite TV shows as they burn some major calories. Especially in our increasingly sedentary, modern society, it’s incredibly important to find alternative ways to maintain healthy blood circulation and mobility. If you were in the market for one of these pedal exercisers make sure that you read a lot of reviews, check warranty information, and review your own requirements for a device prior to purchase. A good starting point is the information contained on this page. Review our recommendations and take the time to read over what buyers are saying- you will see that many users are engaged in lively discussions about the products, giving you great insight into how they perform.